Not to be confused with Docetism. Donatism (Latin: Donatismus, Greek: Δονατισμός Donatismós) was a schism in the Church of Carthage from the fourth to the sixth centuries AD. Donatists argued that Christian clergy must be faultless for their ministry to be effective and their prayers and sacraments to be valid. Donatism had its roots in the long-established Christian community of the Roman Africa province (now Algeria and Tunisia) in the persecutions of Christians under Diocletian. Named after the Berber Christian bishop Donatus Magnus, Donatism flourished during the fourth and fifth centuries. The Roman governor of North Africa, lenient to the large Christian minority under his rule throughout the persecutions, was satisfied when Christians handed over their scriptures as a token repudiation of faith. When the persecution ended, Christians who did so were called traditors—"those who handed (the holy things) over"—by their critics (who were mainly from the poorer classes). Like third-century Novatianism, the Donatists were rigorists; the church must be a church of "saints" (not "sinners"), and sacraments administered by traditors were invalid. In 311 Caecilian (a new bishop of Carthage) was consecrated by Felix of Aptungi, an alleged traditor. His opponents consecrated Majorinus, a short-lived rival who was succeeded by Donatus. Two years later, a commission appointed by Pope Miltiades condemned the Donatists. They persisted, seeing themselves as the true Church with valid sacraments. Because of their association with the Circumcellions, the Donatists were repressed by Roman authorities. Although they had local support, their opponents were supported by Rome. The Donatists were still a force during the lifetime of Augustine of Hippo, and disappeared only after the seventh- and eighth-century Muslim conquest. The Donatists refused to accept the sacraments and spiritual authority of priests and bishops who were traditors during the persecution. The traditors had returned to positions of authority under Constantine I; according to the Donatists, sacraments administered by the traditors were invalid. Whether the sacrament of Penance could reconcile a traditor to full communion was questioned, and the church's position was that the sacrament could. The church still imposed years- (sometimes decades-) long public penance for serious sins. A penitent would first beg for the prayers of those entering a church from outside its doors. They would next be permitted to kneel inside the church during the Liturgy. After being allowed to stand with the congregation, the penitent would finally be allowed to receive the Eucharist again. According to the Donatists, serious sin would permanently disqualify a man from leadership. The validity of sacraments administered by priests and bishops who had been traditors was denied by the Donatists. According to Augustine, a sacrament was from God and ex opere operato (Latin for "from the work carried out”). A priest or bishop in a state of mortal sin could continue to administer valid sacraments. The Donatists believed that a repentant apostate priest could no longer consecrate the Eucharist. Some towns had Donatist and orthodox congregations. The sect developed and grew in North Africa, with unrest and threatened riots in Carthage connected to the bishop controversy. [a] Constantine, hoping to defuse the unrest, gave money to the non-Donatist bishop Caecilian as payment for churches damaged or confiscated during the persecution. Nothing was given to the Donatists; Constantine was apparently not fully aware of the seriousness of the dispute, which his gift exacerbated. The Donatists appealed to Rome for equal treatment; Constantine tasked Miltiades with resolving the issue, which led to the 313 commission. The Donatists refused to abide by the decision of the Roman council, demanding that a local council adjudicate the dispute and appealing directly to Constantine. In a surviving letter, a frustrated Constantine called for what became the first Council of Arles in 314. The council ruled against the Donatists, who again appealed to Constantine. The emperor ordered all parties to Rome for a hearing, ruled in favor of Caecilian and warned against unrest. A delegation from Rome traveled to Carthage in a vain attempt to seek compromise. The Donatists fomented protests and street violence, refusing to compromise in favor of the Catholic bishop. After the Constantinian shift, when other Christians accepted the emperor's decision, the Donatists continued to demonize him. After several attempts at reconciliation, in 317 Constantine issued an edict threatening death to anyone who disturbed the imperial peace; another edict followed, calling for the confiscation of all Donatist church property. Donatus refused to surrender his buildings in Carthage, and the local Roman governor sent troops to deal with him and his followers. Although the historical record is unclear, some Donatists were apparently killed and their clergy exiled. Outside Carthage, Donatist churches and clergy were undisturbed. Constantine's efforts to unite the church and the Donatists failed, and by 321 he asked the bishops to show moderation and patience to the sect in an open letter. Laws against the Donatists were decreed by Valentinian I after the defeat of the Donatist usurper, Firmus, in North Africa. Augustine of Hippo campaigned against Donatism as bishop; through his efforts, orthodoxy gained the upper hand. According to Augustine and the church, the validity of sacraments was a property of the priesthood independent of individual character. Influenced by the Old Testament, he believed in discipline as a means of education. In his letter to Vincentius, Augustine used the New Testament Parable of the Great Banquet to justify using force against the Donatists: "You are of opinion that no one should be compelled to follow righteousness; and yet you read that the householder said to his servants, 'Whomsoever ye shall find, compel them to come in.'" Marcellinus of Carthage, Emperor Honorius's secretary of state, condemned with decree the Donatists as heretical and demanded that they surrender their churches in 409. This was made possible by a collatio in which St. Augustine legally proved that Constantine had chosen the church over the Donatists as the imperial church. 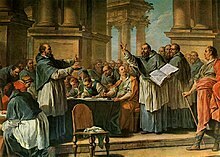 The Donatists were persecuted by the Roman authorities to such a degree that Augustine protested their treatment. The Council of Trent (1545-1563) taught that in the divine sacrifice of the Holy Mass "is contained and immolated, in an unbloody manner, the same Christ that offered Himself in a bloody manner upon the altar of the Cross. Hence, it is the same victim, tha same sacrificing-priest who offers Himself now through the ministry of priests and who once offers Himself upon the Cross". The worth of the sacrifice does not depend by the celebrating priest (or bishop), but on the "worth of the victim and on the dignity of the chief priest- no other than Jesus Christ Himself"
The effects of Augustine's theological success and the emperor's legal action were somewhat reversed when the Vandals conquered North Africa. Donatism may have also gradually declined because Donatists and orthodox Catholics were equally marginalised by the Arian Vandals, but it survived the Vandal occupation and Justinian I's Byzantine reconquest. Although it is unknown how long Donatism persisted, some Christian historians believe that the schism and its ensuing unrest in the Christian community facilitated the seventh-century Muslim conquest of the region. The Rogatists were a pacifist breakaway faction who rejected the excesses of the Circumcellions and Donatists. The Circumcellions, a name based on circum cellas euntes ("going around larders") because of their practice of living on the peasants they sought to indoctrinate. They were a disparate series of extremist groups who regarded martyrdom as the supreme Christian virtue (disagreeing with the Episcopal see of Carthage on the primacy of chastity, sobriety, humility, and charity). Attracted by their extremism, some Donatists found them useful allies. It is very likely that this breakaway group's condemnation of property and slavery, and advocation of free love, canceling debt, and freeing slaves derived from Carpocrates' Doctrine of libertinage, the refusal of marriage, the abolition of social castes and the communion of goods. Apostolic churches, a sect emulating the Apostles about which little is known But it is very plausible that they were influenced from precedent gnostic Apotactics. In Mauretania and Numidia, the splinter groups were so numerous that the Donatists could not name them all. Early Kharijites, a strict sect of Islam the same Berber region. For several centuries during the High Middle Ages and the Reformation, accusations of Donatism were leveled against church-reform movements which criticized clerical immorality on theological grounds. The early reformers John Wycliffe and Jan Hus were accused of Donatism by their theological opponents. Wycliffe taught that the moral corruption of priests invalidated their offices and sacraments, a belief characterizing Donatism. Hus similarly argued that a prelate's moral character determined his ecclesiastical authority, a position his contemporaries compared to Donatism and condemned as heresy at the Council of Constance. During the Reformation, Catholic Counter-Reformers such as Johann Eck accused the magisterial Reformers of Donatism (although the latter had partially distanced themselves from Wycliffe's theology to avoid such a charge). Magisterial Reformers like Ulrich Zwingli labeled radical Reformers, such as the Anabaptists, as Donatists; Catholics were portrayed in Reformation rhetoric as Pelagian, another early Christian heresy. In Eastern Orthodoxy, the Bezpopovtsy (priestless) strain of Old Believers believed that because the Russian bishops acquiesced to Patriarch Nikon's reforms they (and the other patriarchs) forfeited any claim to apostolic succession. Accusations of Donatism remain common in contemporary intra-Christian polemics. Conservative Lutherans are sometimes called Donatists by their liberal brethren, referring to their doctrine of church fellowship and their position that churches which deny that Jesus’ body and blood are eaten during the Eucharist do not celebrate a valid Lord's Supper. In the Catholic Church, the Society of Saint Pius X has been accused of Donatist beliefs. ^ The remainder of this paragraph comes from Frend 1952, who derived his chronology primarily from Optatus' Against the Donatists (one of the only surviving primary sources). ^ Cantor 1995, pp. 51f. ^ Cantor 1995, p. 51. ^ Cross, FL, ed. (2005), "Novatianism", The Oxford dictionary of the Christian church, New York: Oxford University Press . ^ Cross, FL, ed. (2005), "Donatism", The Oxford dictionary of the Christian church, New York: Oxford University Press . ^ a b Frend 1952, pp. 144–45. ^ Frend 1952, p. 156. ^ Frend 1952, p. 157. ^ Frend 1952, pp. 159 60. ^ Frend 1952, pp. 161 62; from the letters of Constantine preserved by Optatus. ^ Brown, P. 1967. Augustine of Hippo. London: Faber & Faber. ^ "Augustine on how it is legitimate to 'coerce' Donatist Christians to join the Catholic Church". Archived from the original on September 25, 2014. Retrieved September 25, 2017. ^ Augustine, Aurelius, "2", Letter (134) . ^ Mitchell, Stephen (2007). A History of the Later Roman Empire. Blackwell. p. 282. ^ "Donatism", Concordia Cyclopedia, CMU, archived from the original on 2011-07-16 . ^ Michael Gaddis (2005), There Is No Crime for Those Who Have Christ, Berkeley: University of California Press, p. 122. ^ Durant, Will (1972). The age of faith. New York: Simon & Schuster. ^ Elizabeth Savage (1997). A Gateway to Hell, a Gateway to Paradise. Darwin Press. p. 98. ^ Pelikan, Jaroslav (2003), Credo: Historical and Theological Guide to Creeds and Confessions of Faith in the Christian Tradition, Yale University Press, p. 474 . ^ Verduin, Leonard. "1". The Reformers and Their Stepchildren. ISBN 0-8028-3791-3. ^ The doctrine of church fellowship, Reclaiming Walther . ^ Metzger, Paul W, What Constitutes A Valid Celebration of The Lord’s Supper? (PDF), WLS essays . ^ "A Case Study In Modern-Day Donatism". Retrieved 2016-03-28. Cantor, Norman F (1995), The Civilization of the Middle Ages . Daniel, Robin (2010), This Holy Seed: Faith, Hope and Love in the Early Churches of North Africa, Chester: Tamarisk Publications, ISBN 978-0-9538565-3-4 . Frend, WHC (1952), The Donatist Church: A Movement of Protest in Roman North Africa, Oxford University Press, ISBN 0-19-826408-9 . Tilley, Maureen A, ed. (1996), Donatist martyr stories: the Church in conflict in Roman North Africa, Liverpool University Press, ISBN 0-85323-931-2 . ——— (1997), The Bible in Christian North Africa: The Donatist World, Fortress Press, ISBN 0-8006-2880-2 . Augustine of Hippo (2014), "The Writings of St. Augustine Against the Donatists", in Philip Schaff; Rev. Chester D. Hartranft D.D. ; Paul A. Boer Sr. (eds. ), The Writings of St. Augustine Against the Donatists, translated by Rev. J. R. King M.A., CreateSpace Independent Publishing Platform; First Edition edition, ISBN 978-1499581010 . Cameron, Michael (2001), "Augustine's Use of the Song of Songs Against the Donatists", in van Fleteren, Frederick (ed. ), Augustine: Biblical Exegete, New York: Peter Lang . Corcoran, John Anthony (1997), Augustinus Contra Donatistas, Donaldson: Graduate Theological Foundation . Gaddis, Michael (2005), There Is No Crime for Those Who Have Christ, Berkeley: University of California Press . Keleher, James P (1961), Saint Augustine’s Notion of Schism in the Donatist Controversy, Mundelein: Saint Mary of the Lake Seminary . Lewis, Gordon R (Spring 1971), "Violence in the Name of Christ: The Significance of Augustine's Donatist Controversy for Today", Journal of the Evangelical Theological Society, 14 (2): 103–10 . Paas, Steven (2005), A Conflict on Authority in the Early African Church: Augustine of Hippo and the Donatists, Kachere, Zomba . Park, Jae-Eun (Aug 2013), "Lacking Love or Conveying Love? The Fundamental Roots of the Donatists and Augustine's Nuanced Treatment of Them", The Reformed Theological Review, 72 (2): 103–21 . Russell, Frederick H. (1999), "Persuading the Donatists: Augustine's Coercion by Words", in Klingshirn, William E (ed. ), Limits of Ancient Christianity: Essays on Late Antique Thought and Culture in Honor of R. A. Markus, Ann Arbor: University of Michigan Press . Scalise, Charles J (Fall 1996), "Exegetical Warrants for Religious Persecution: Augustine vs. the Donatists", Review & Expositor, 93 (4): 497–506, doi:10.1177/003463739609300405 . Shimmyo, Theodore T (1991), "St Augustine's Treatment of the Donatist Heresy: An Interpretation", Patristic and Byzantine Review, 10 (3): 173–82 . Donatus & the Donatist Schism, UK: Early Church , a list of primary and secondary sources on the Donatists. "Donatists", Catholic Encyclopedia, New advent , goes into some detail about the politics in the early church that was the background for the rise and fall of Donatism. of Cirta, Petilian, Letter, Sean Multimedia , written by a Donatist leader. Merrills, Andrew H (2004), Vandals, Romans and Berbers: New Perspectives on Late Antique North Africa, Ashgate - new analysis of the textual, epigraphic and archaeological record. Donatism. Online Dynamic Bibliography . This page was last edited on 29 March 2019, at 14:50 (UTC).